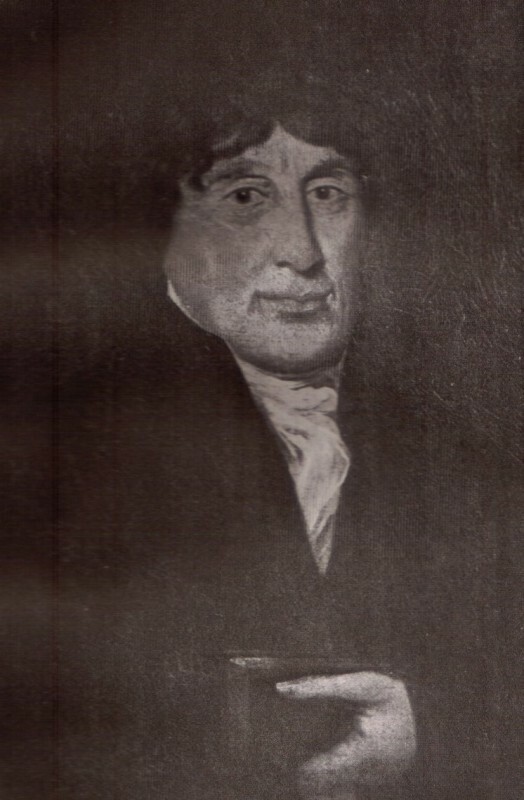 Several acres of land on part of which the present church stands was given by Hugford Hassall, a Catholic benefactor for the building of a priest’s house and small Chapel. A new rectangular church (50 ft by 22 ft) designed by Augustus Welby Northmoor Pugin was built at the side of the 1761 priest’s house. 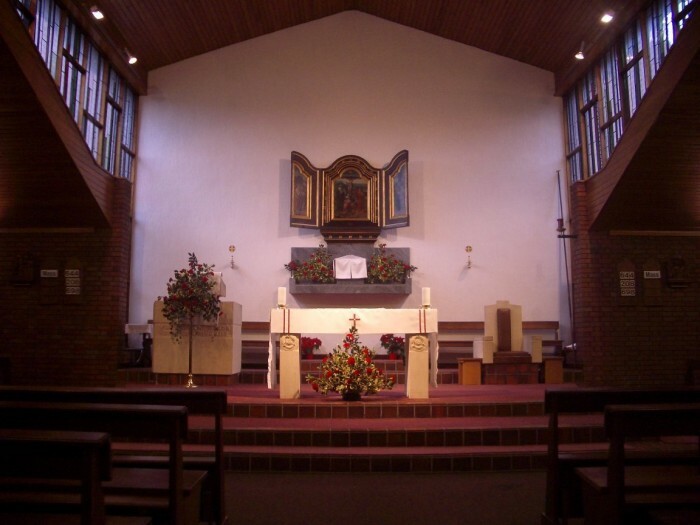 St Augustine’s Church in Solihull has been described as Pugin’s first church and it is undoubtedly the oldest of Pugin’s existing churches. The building was begun in 1838 and opened on 6th February 1839 with Pugin as the cross bearer. 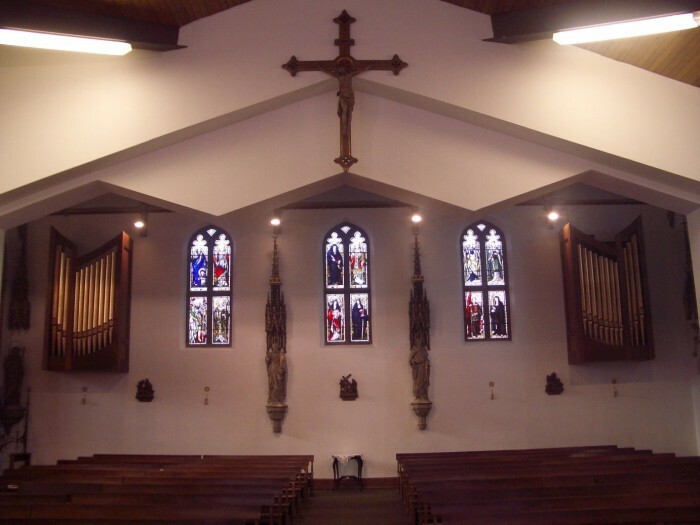 It did not follow the traditional orientation of Catholic churches which places the altar facing East. Pugin’s altar faced almost South West. Hence the references to “East” and “West” in relation to St Augustine’s are purely conventional and not accurate geographically. It is not known why the church was built with the altar facing this way. Three lancet windows were incorporated into the “West” wall but were replaced in 1904 by the present three light perpendicular window (Window 7). The “East” wall above the altar was opened to accommodate a large five light perpendicular window (Window 1). Joseph Hansom of Hansom Cab fame designed a new priest’s house adjacent to the Pugin church facing what is now Station Road. The 1741 priest’s house was demolished to make room for a Chancel to be added to the Pugin church. 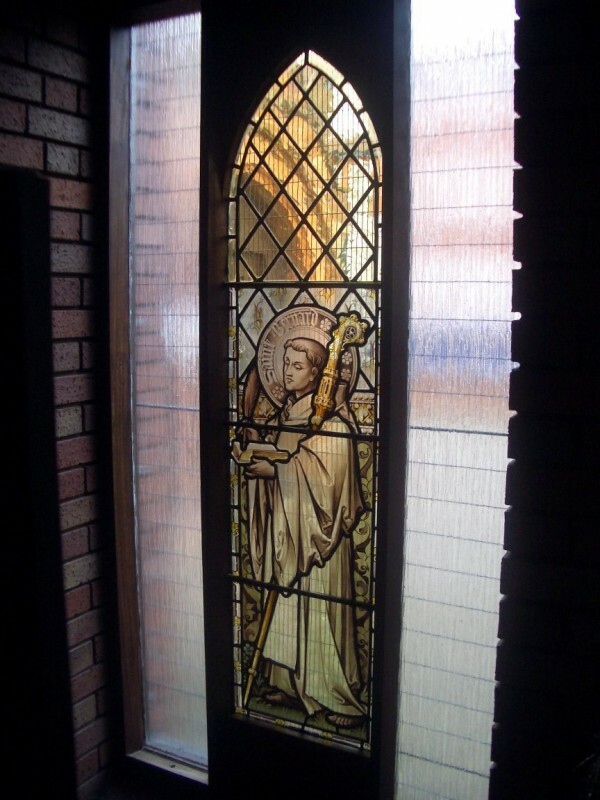 The “East” stained glass window (Window 1) was relocated to the place where it is currently situated. The Chancel is now known as the Blessed Sacrament Chapel. A small front porch was added. 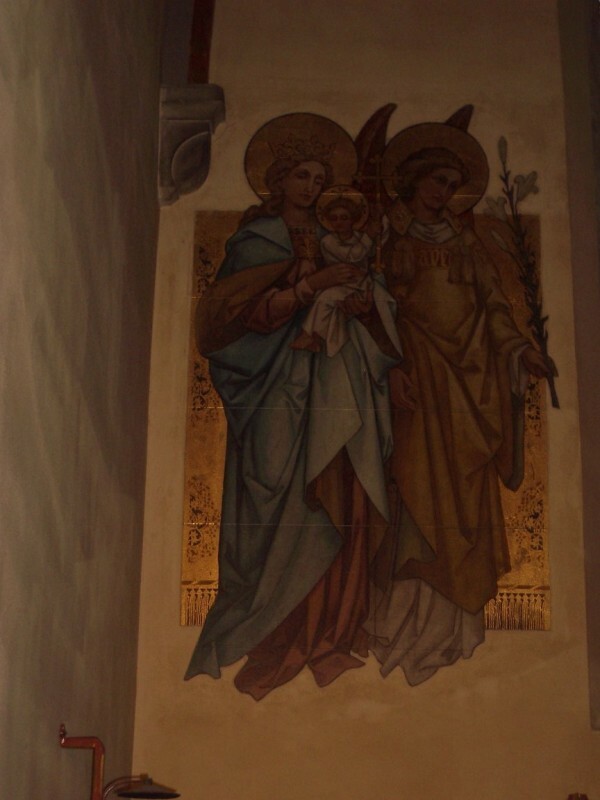 Pugin left the church undecorated except for the ceiling which was painted blue with gold stars. In 1892 murals were painted by Joseph A Pippet. The original altar, tabernacle and piscina were designed by Pugin. The original bell-turret was removed and the present belfry, with a new bell, was erected. Sometime before 1904 a choir gallery was erected in front of the three lancet windows in the “West” wall. This was removed in 1979. The three lancet windows in the “West” wall were removed and replaced with the present three light perpendicular window (Window 7). A “Lourdes grotto” was erected in the front garden. The yew tree to its left is probably hundreds of years old as a diameter of 15cm can represent 100 years of growth. The Grotto was built free of cost by the Tarplee brothers. The 1878 presbytery was demolished to make room for the extension of the church. The seating in the Pugin church was turned through 90 degrees to face the new altar. A flat above the sacristy was incorporated to provide accommodation for the priest. The architect was Mr Brian Rush. The ceiling of the Blessed Sacrament Chapel was repainted by Tony Nay using stencils to match the original patterns. 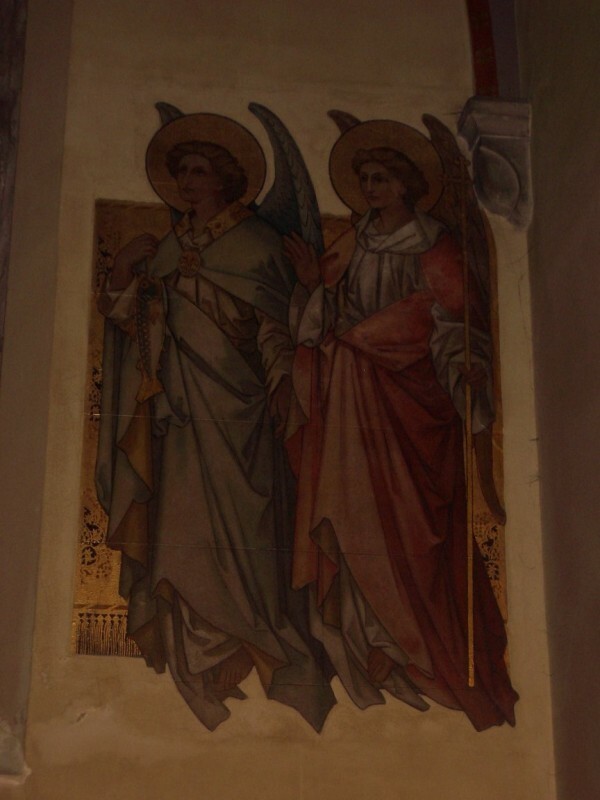 Similarly the Pippet-painted angels on the “East” wall were restored. Mr John Holmes designed a new presbytery. The side entrance porch was extended, when the Parish Hall was renovated. 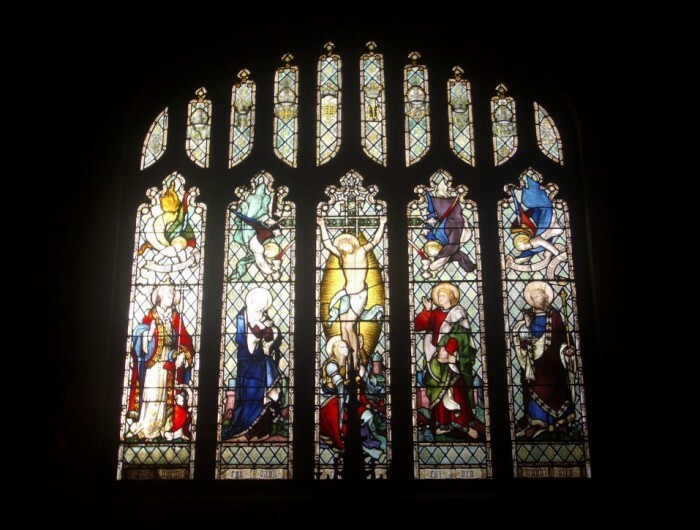 The “East” window (Window 1) was designed by John Hardman Powell and made by John Hardman (son-in-law of Pugin). It has five main lights with two upper receptacles corresponding to each. The background is pale blue tinted glass with a Tudor rose border. The central light depicts the Crucifixion. Our Lord is surrounded by golden rays of sunlight and St Mary Magdalene is kneeling at the foot of the Cross. Our lady is drawn in the tradition of the Flemish school and is to the left of the Cross. On the right is St John. 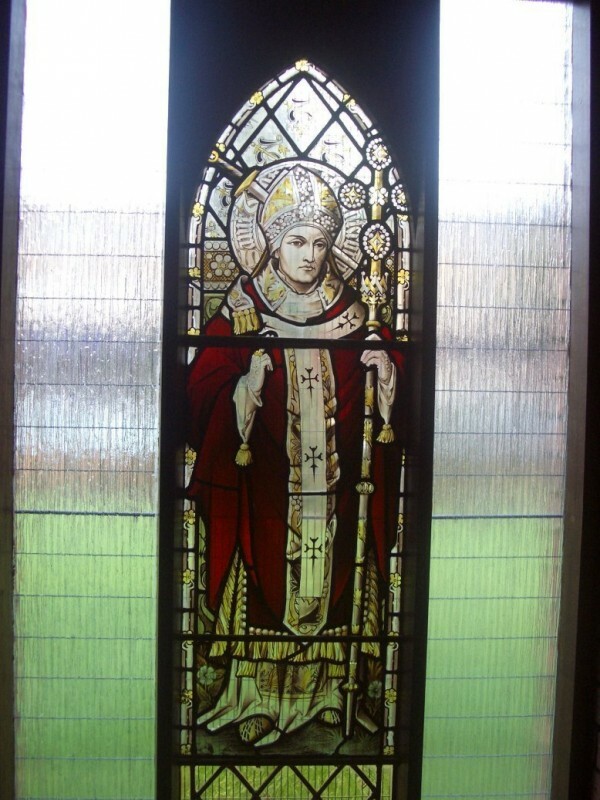 The far left light is a picture of St Augustine of Canterbury and on the far right is St Edward, King and Confessor. 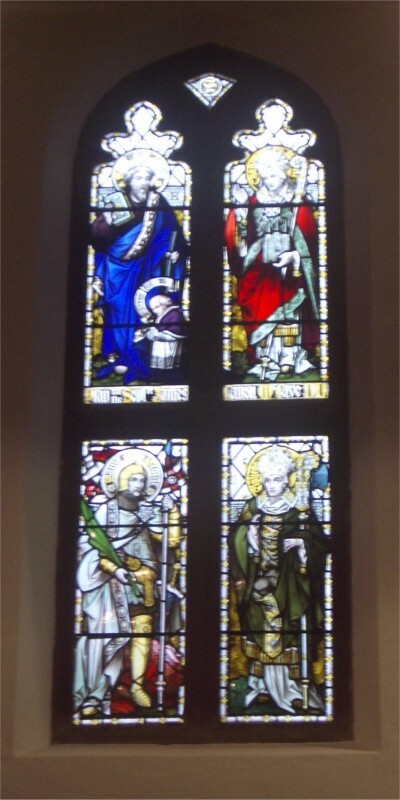 Above each of these figures are the four “Solihull Angels”. 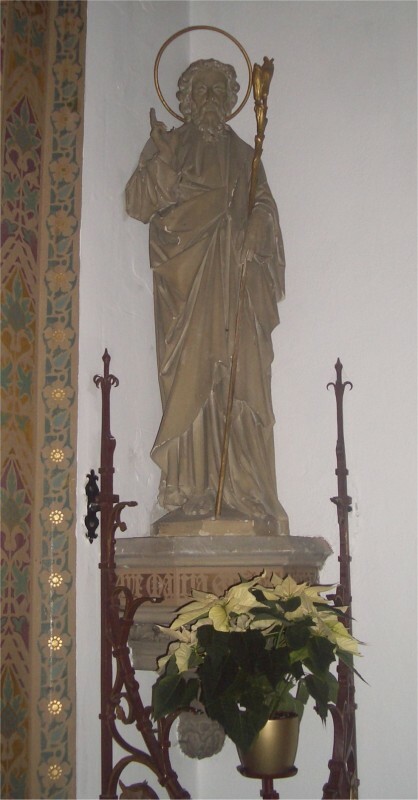 The donor, Father Edward Hodson (1849-1877) is portrayed beneath the figure of St Augustine as a miniature. Melchisedech and Abraham – designed by Joseph Pippet, drawn by Oswald Pippet and made by Hardman (1902). 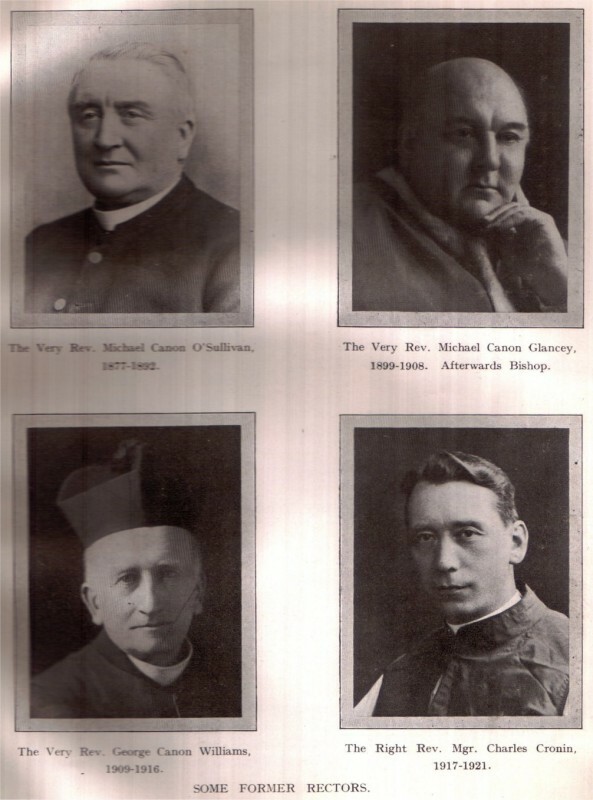 The donor was Reverend M Glancy (1899-1908). St James, St Chad, St George and St Elphege – designed by Gabriel Pippet, drawn by Oswald Pippet and made by Hardman (1900). 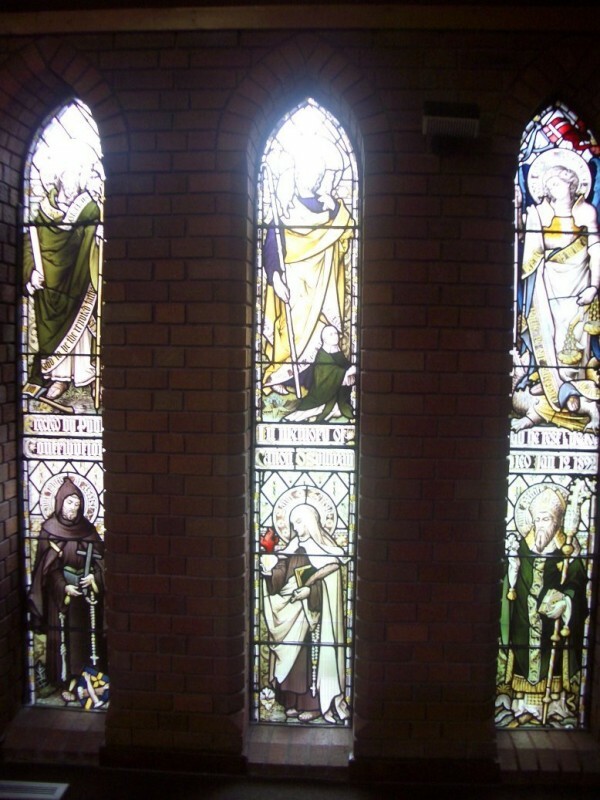 Venerable Bede, St Winifred, St Wilfred and St Hilda – designed by Gabriel Pippet, drawn by Oswald Pippet and made by Hardman (1900). St Peter, St Maurice, St Maud and St Clare – designed by Joseph Pippet, drawn by Oswald Pippet and made by Hardman (1909). 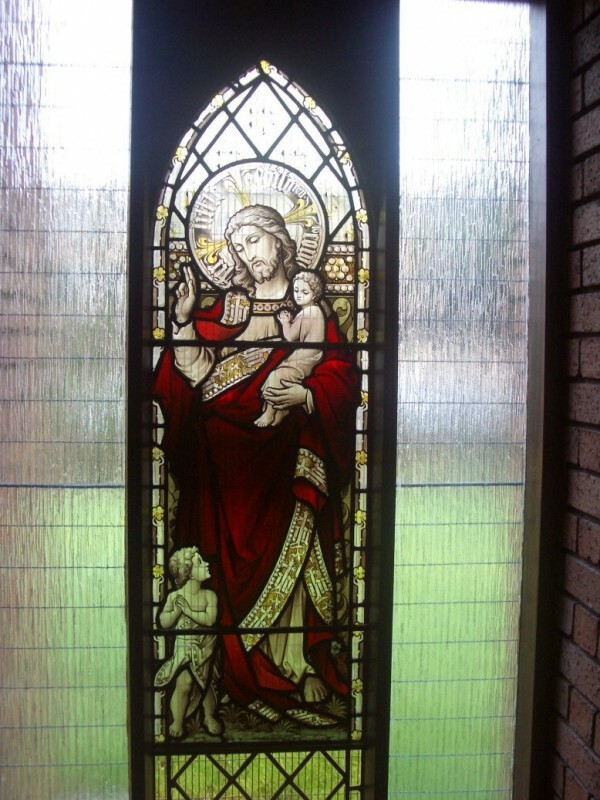 The “West” window was designed and drawn by Elphege and Oswald Pippet. 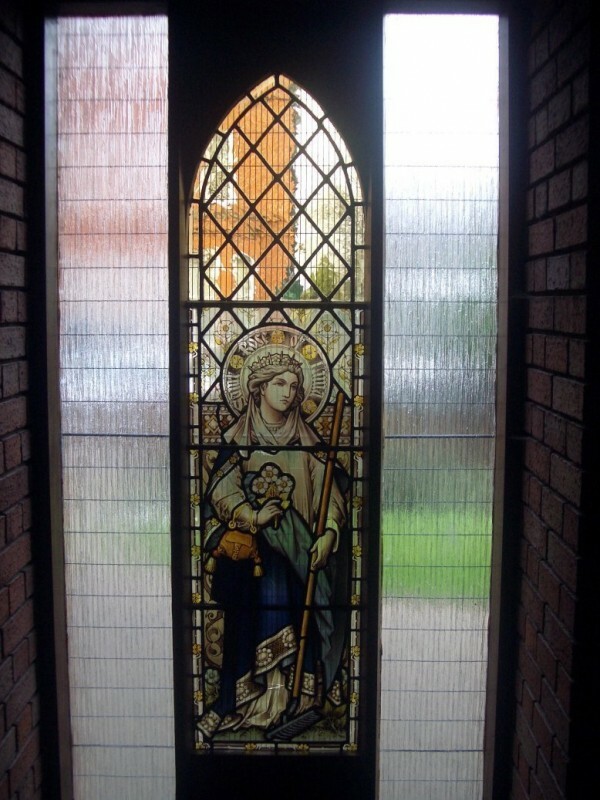 Made by Harvey and Ashby Birmingham (1904). The three light perpendicular window installed in the “West” wall in 1904 replaced the original three lancet window. The lights are broad with a large surface area representing stonework. 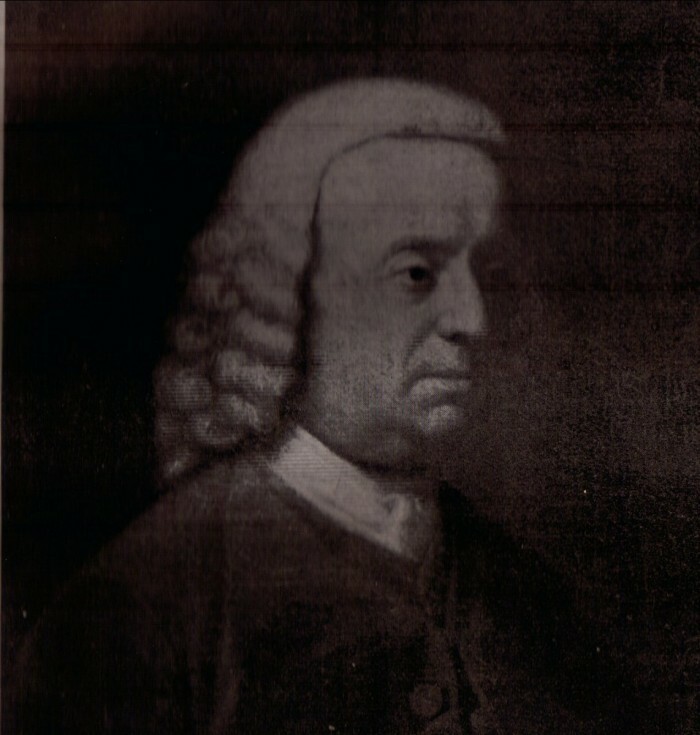 The donors were the children of Joseph and Juliet Pippet. 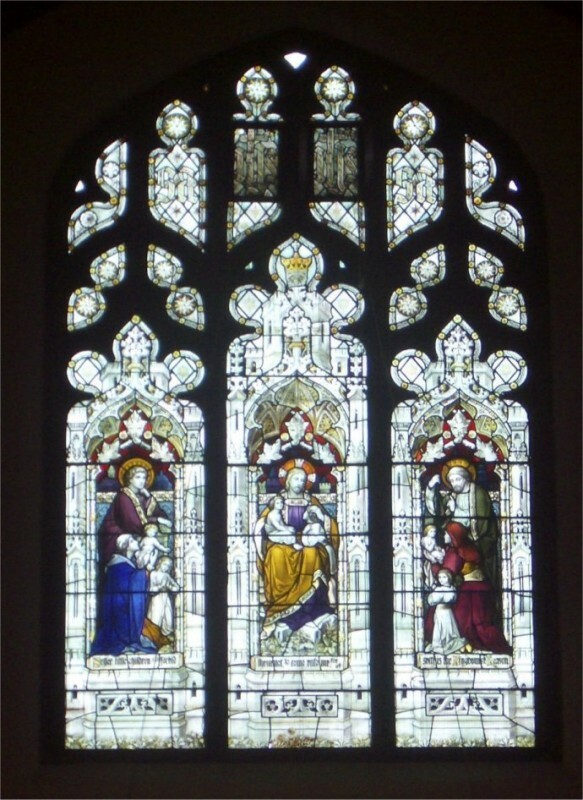 Windows 8-16 were designed by Gabriel Pippet, drawn by Oswald Pippet and made by Hardman, in memory of Canon O’Sullivan (1877-1892). The origins of the triptych are uncertain. It is thought to be a gift from Pugin. It is the work of a Flemish artist and though painted later, it is in the style of the school of Rogier Van Der Weyden (c 1397-1464). 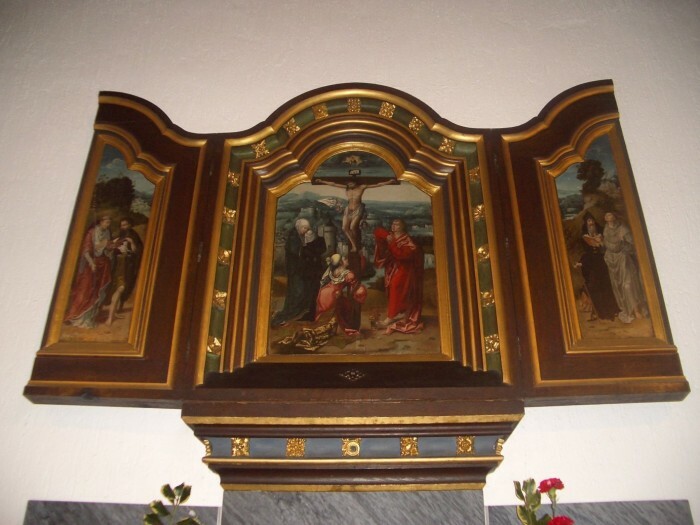 Wooden triptychs were often used as portable altarpieces with their protective folding doors. 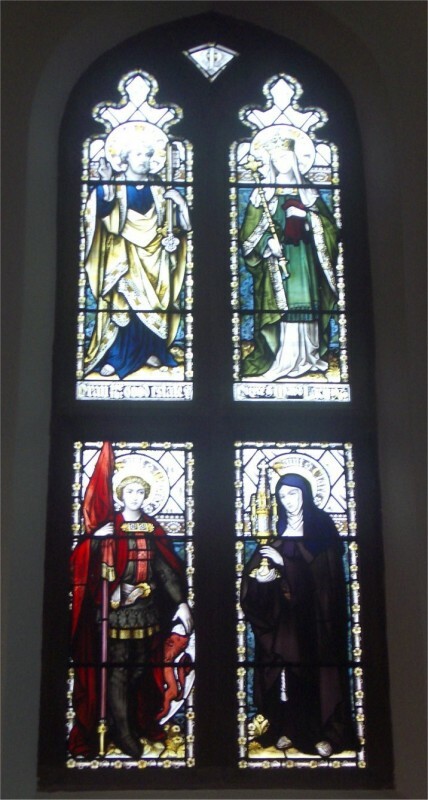 The central panel is a depiction of the Crucifixion with Our Lady, St Mary Magdalene and St John. The figure of Our Lord shows realistic detail with a piece of loincloth blown out against the background. The figure of Our Lady with hidden hands is similar to Van Der Weyden’s numerous paintings of the same subject. 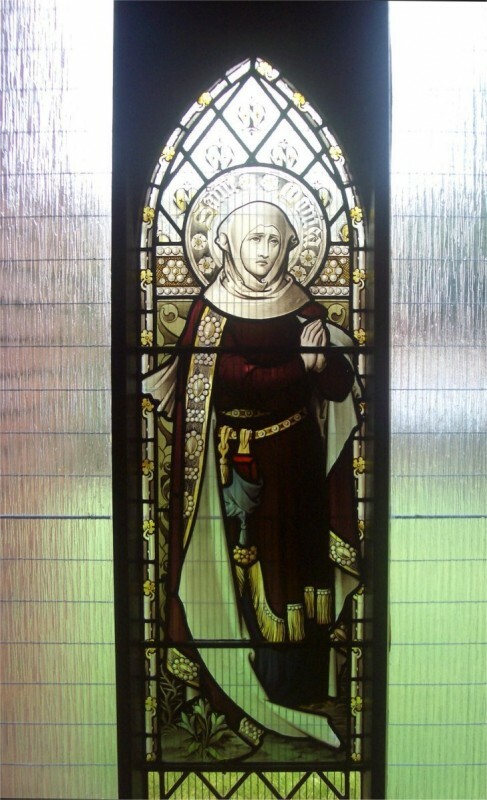 Likewise St Mary Magdalene with her fifteenth century dress. Unfortunately the flowing robes over St John’s shoulders are all that remains of this part of the original painting. The triptych has suffered from early attempts at restoration. The background comprises miniatures of religious, civil and military architecture, a panorama of a medieval city, river woodlands and hills in the distance. A tiny aperture in the sky shows an image of God the Father. The side panels’ subjects are St Jerome and St John the Baptist on the left and St Anthony the Hermit and St Francis of Assisi on the right. 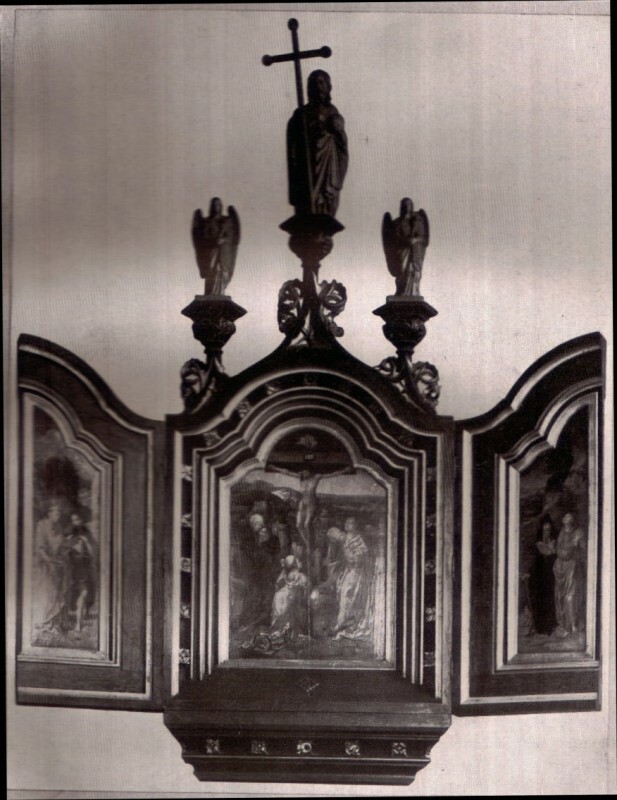 A 1938 picture of the Triptych shows three carved figures above the central panel which have since been removed. The plate is currently placed below the Tabernacle whilst the Cross hangs on the wall that divides the old part of the church from the new. 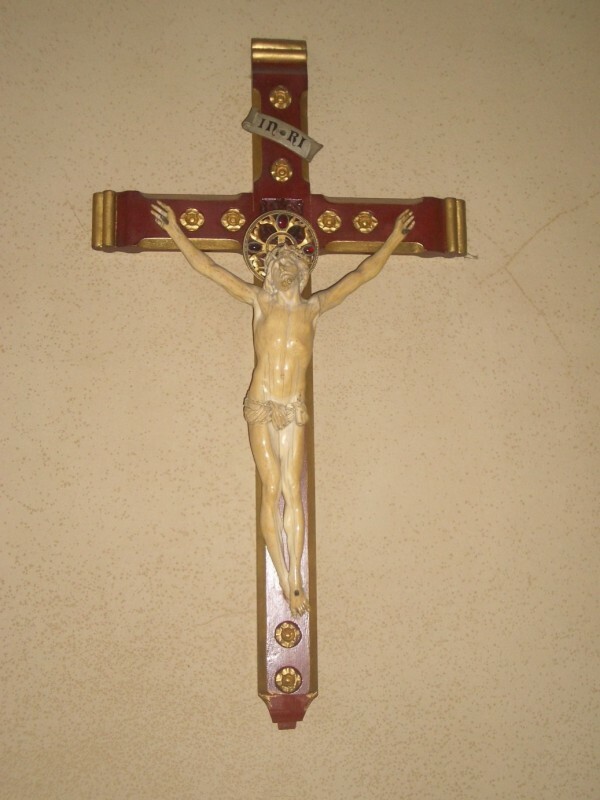 The seventeenth century Italian Ivory Crucifix is positioned in the Blessed Sacrament Chapel. It is believed it was a gift from Pugin. The natural curve in the original tusk has been used to represent the strained position of Our Lord’s body. 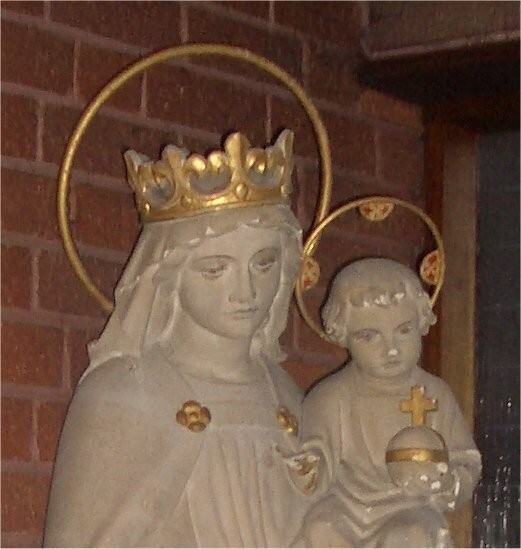 The stone statues of the Sacred Heart (A) and Our Lady Queen of Heaven (G) were carved by John Roddis of Aston and given by Joseph Pippet in memory of his parents in 1892. 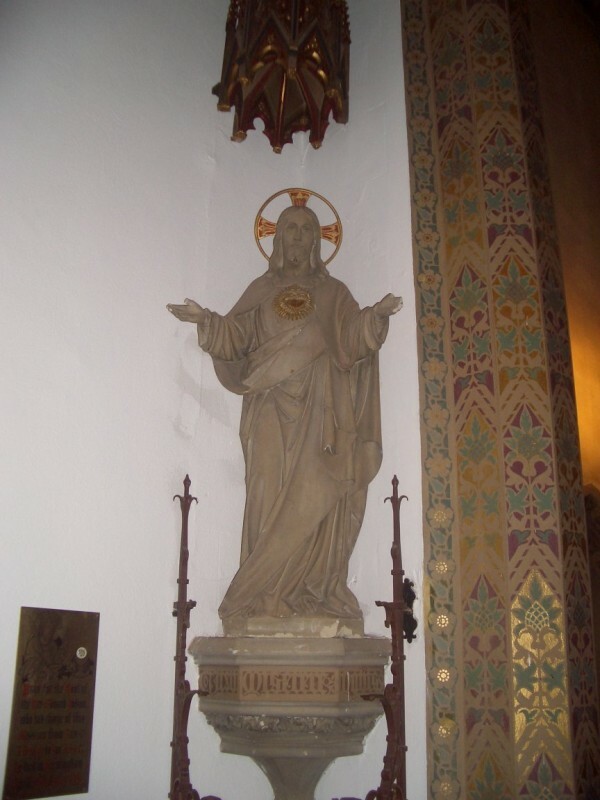 The stone canopy above the Sacred Heart is carved in fifteenth century Gothic style. St Peter (C) and St Paul (D) St Joseph (B) and St Augustine (H) are also carved in stone by Martyn of Cheltenham and have oak canopies. 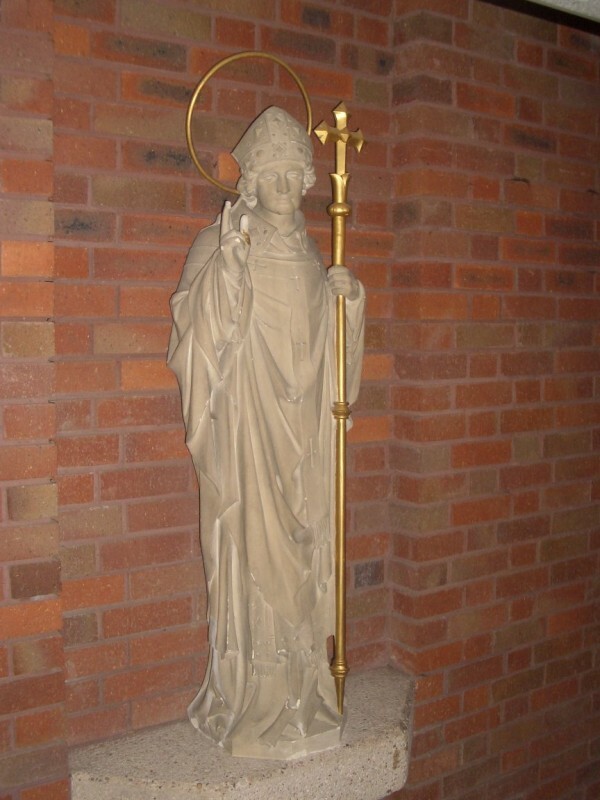 The iron candle coronnas were given by Canon Glancey. The angels at (E) and (F) stand either side of Window 7. 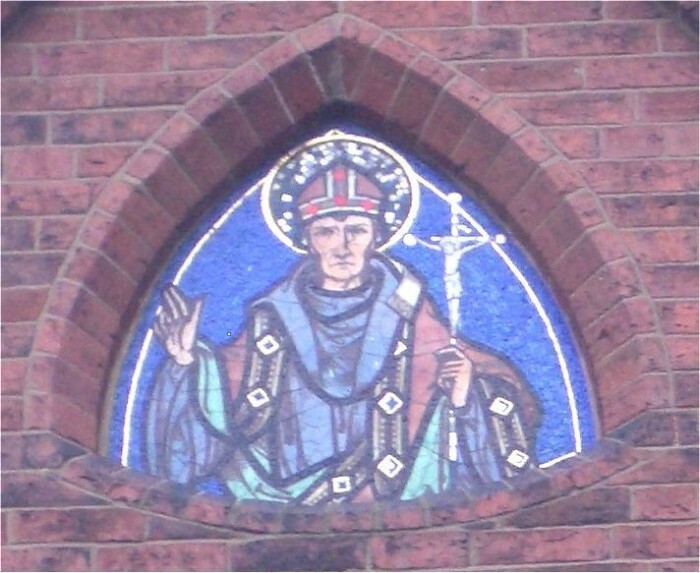 The mosaic of St Augustine above the 1884 front porch was designed and executed by Gabriel Pippet. 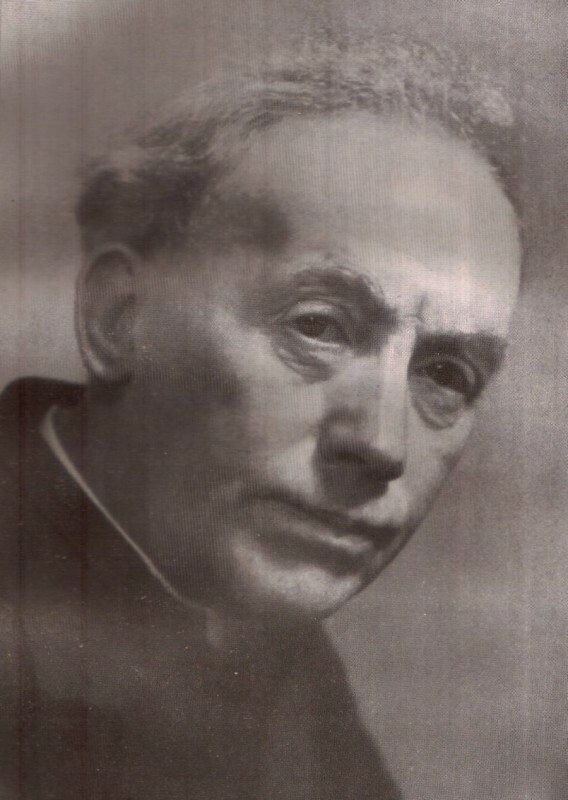 We are indebted to Bernard Malley who wrote "Solihull and the Catholic Faith" in 1939 to mark the centenary of St Augustine's Church. Much of the information about the Church has been taken from this book. Our thanks also to Fr Timothy Ford for the use of his photographs.